History and Anecdotal Information: Frankincense is one of the most critically acclaimed essential oils. 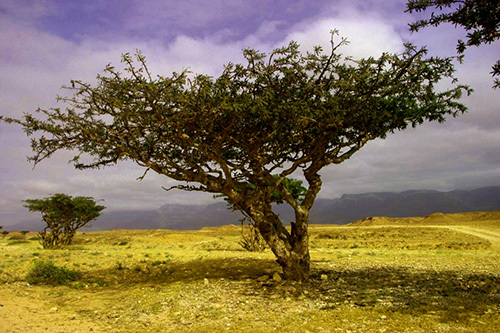 Obtained from several Boswellia tree species, Frankincense has been used for over 5,000 years. Its resin, once collected, is one of the world’s most popular topical skincare ingredients. The trees grow in Somalia, Ethiopia, Yemen and Oman. Frankincense oil, derived from hardened tree resin, was initially used as an aromatic. Frankincense became popular for its religious and cultural applications. Its pleasant, earthy scent has made it a go-to aromatic since Fifth Dynasty Egypt 2500 BC. Later utilized in Roman Empire religious ceremonies, it then carried over into Ancient Greece and the Orient where it was used primarily as an incense in Taoist and Buddhist rituals. It later became popular in the Christian faith—especially in Catholicism. Chemical Composition: Frankincense Oil is extracted from the gum or resin of Frankincense or Olibanum trees, whose scientific name is Boswellia Carteri. The oil contains Alpha Pinene, Actanol, Bornyl Acetate, Linalool, Octyl Acetate, Incensole and Incensyl Acetate. These components are responsible for it's anti-inflammatory and anti-depressive properties. Frankincense is non-toxic, non-irritant and non-allergenic, which makes it one of the safest oils to use at home. General Benefits: Frankincense essential oil benefits all body systems, including respiratory, digestive, nervous, immune and excretory systems, while also aiding the absorption of nutrients into the body. A powerful aromatherapy oil, Frankincense is used in multiple types of products. It is included in toothpastes as it strengthens the gums and helps prevent cavities, toothache bad breath. It is found in shampoos since it strengthens hair roots, and it's unique fragrance is enjoyed in soaps, lotions and facial creams, and is an all-natural household astringent cleaning product. Skin Care Applications: Frankincense skin care products improve skin tone and elasticity and helps healthy cell regeneration. It can reverse signs of aging and reduce the appearance of stretch marks and scars, including acne scars and is beneficial when added to anti-aging skincare products. It also helps eliminate sun spots, remove crow's feet around the eyes and tone and tighten skin while replacing old or dying cells with healthy ones. Its astringent properties help protect skin cells -preventing wrinkles and lifting and tightening the skin to naturally slow signs of aging.